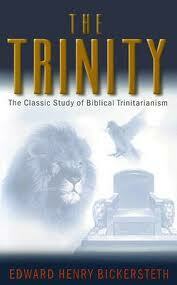 "The Trinity: A Classic Study of Biblical Trinitarianism" by Edward H. Bickersteth. This was a tough but absolutely rewarding read. I have never come across a book that outlined in great detail the glorious truths about the essence, unity, distinctions and relationships between the Godhead. Bickersteth wrote not only with depth of knowledge but with a spirit of evangelistic zeal. His concern for his reader's soul is throughout his work. Somewhere back in the late 1800s and in the church of England there still remained a witness for Bible truth with a soul-winning fire and Bickersteth's work is a case in point. 1. What Study the Trinity? (C) 2000, Paperback, 182 pages of thick reading. Roman numerals are supplied in the back to assist us who have a hard time remembering what "L" is in that numeric system. (WOW! am I so glad for the Hindu-Arabic numbering system).